For a while, I reliably wrote a style profile each week on Monday. Then suddenly last week I found that I didn’t really care to write a traditional style profile. Here I am again, unmoved by the prospect of writing a specific beer style profile. Now please do let me know if you have been waiting for a particular beer style profile, and I’ll gladly write it up. But for now, here’s how I’m feeling about beer styles. This week it is all about the Session for me. This week is Session 11: Doppelbock. For those of you not familiar, The Session is a group blogging day on a common topic. This month it’s Doppelbock. So I am going to learn a bit of history on the style, and taste a few Bocks and Doppelbocks. Ultimately, I’ll hopefully find something really interesting along the way to talk about on Friday. Until then, my first day of BockFest is a profile of the Bock style, including a diversion into Doppelbock. Belgium is world renowned as one of the greatest beer places on earth. Beer is highly regarded and truly respected in far more places there than you’re likely to find in the same geographical area here in the US. Their beers range from delicate to robust to funky to big and sweet. 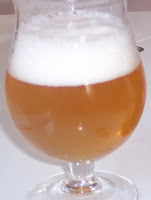 Today I am going to talk a bit about a big sweet style, the Tripel. I am going to head across the ocean to Belgium for this week’s style profile article. The brewers of Belgium are renowned for their deeply flavorful and complex beers. The Dubbel is among the most robust of the Belgian styles. Many Belgian brewers, particularly the Abbey brewers, have three main lines of beers: Enkel, Dubbel, and Tripel. They ascend in alcohol strength, but each has their own character. For example, the Tripel has a lighter color than the Dubbel. But the Tripel can be for another day. Today is about the Dubbel. Perhaps the biggest misconception about beer is that it is a simple drink; fizzy yellow swill. Many people (presumably the half of America that prefers Bud) believe that beer should be low in flavor and high in “refreshment”. People from all walks of life believe that complex flavors and deep rich alcohol pleasure are reserved for wine and spirits. Perhaps that’s why the beer style creators called this one Barley Wine. It’s like a way to say to everyone who sees it: this is big and sophisticated. It is unfortunate that we have to call our beloved beer a “wine” in an attempt to garner respect, but no matter what you call it, a barley wine is a thing of beauty. Guinness is one of the most famous beers of all time. Everyone will immediately recognize its opaque black body and dense tan head formed of tiny bubbles that slowly settle to the top of the glass. Much of the characteristic head comes from Nitrogen-based “carbonation” systems used for dispensing the beer. 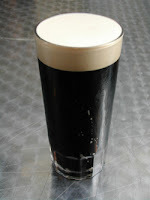 But the dark black color of the beer is the classic trademark appearance of a Stout.